Budd’s BMW Oakville is your ultimate destination for the BMW 6 Series in the Burlington area. Darryl Budd is quoted as saying “A simile on the face of a happy customer is a curve that sets everything straight.” The professional team at BMW Oakville does its best to fulfill this wish with each and every customer. We believe that you are an extension of our family and we welcome your sense of curiosity and enthusiasm. 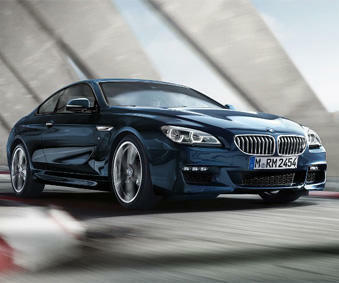 The BMW 6 Series Coupe demonstrates grace and power in equal measure. The quality promised by its smooth, athletic design is matched on the inside as well. Exclusive bicolour Nappa leather with high quality wood trims and refined contrast stitching creates a luxurious interior ambience. In combination with M Sport, roomy air inlets and prominent tailpipe finishers, the BMW 6 Series Coupe further promotes the car’s athletic look. The kidney grille, gleaming slats flanked by LED headlights creates an exclusive impression that appeals to all the senses. With high torque engines and inventive chassis and transmission technologies, the BMW Series Coupe is the perfect sport driving experience. Launch Control enables maximum acceleration and a maximum pulse rate at the same time. And thanks to unique BMW EfficientDynamics technologies, you can rest assured that fuel consumption is at its best during your everyday driving. Trust the experts at BMW Oakville to provide you with unparalleled customer service.